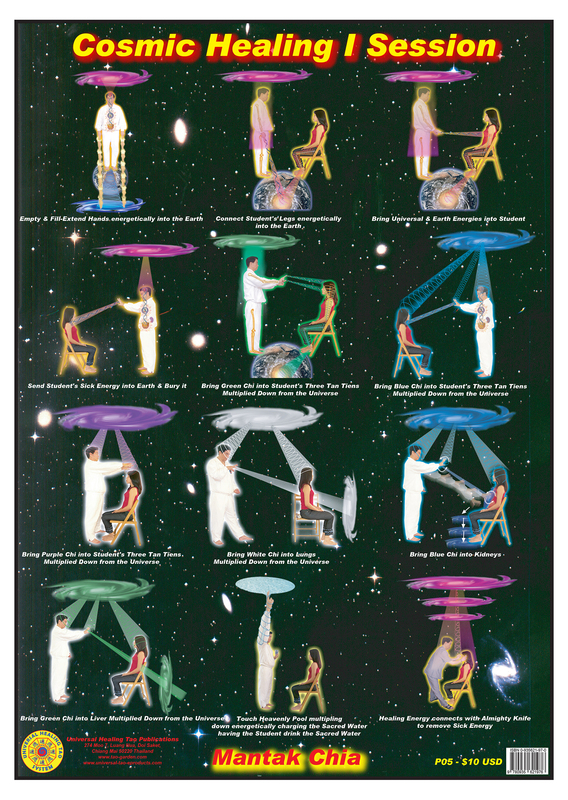 In this poster Master Chia illustrates the Hand Techniques extending down into the Earth and Universe drawing down the Healing Colors from the Cosmos to the student and healing the student removing the sick energy. Through the Cosmic Chi Kung I formulas (Grabbing the Moon, Bridge and Regulator Channels, Yin (Functional) and Yang (Governing) Channels and Planets to Organs) you can activate the negative and positive channels in the body. Cosmic Chi Kung (formally known as Buddha Palm) utilizes hand energy line techniques that connect with vital organs opening your body up to be healed by the Cosmos.